As my graduate assistantship in the Special Collections & Archives Division nears its end, I thought I’d say good-bye to Special Collections by sharing a few of my favorite items from our collection. My previous MA focused on medieval religious and intellectual history, and unsurprisingly, my favorite items in FSU Special Collections & Archives relate to that field. From the catalog: Written in a humanistic hand by a single scribe on parchment. Initials in red with gold, blue with gold and green with gold ornament. Written by nuns in a convent. 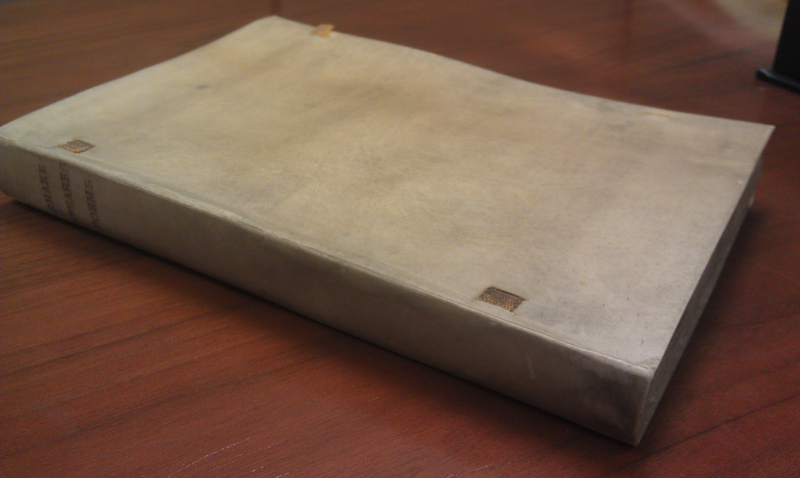 Why I love it: Anulus Nuptialis is notable for its binding (thought to be the original Renaissance binding). But I also love its topic. Written by Venetian nuns during the Renaissance, it describes the nun’s mystical union with God. This was a popular theme among medieval religious women, and I love seeing its continuity through the Italian Renaissance. For more information about this volume, see here. From the catalog: Written in one hand, in Gothic cursive script. Rubricated. Contemporary monastic binding, heavy wooden boards with remains of leather covering, brass cornerpieces and 10 brass bosses, clasps wanting; leaves from an earlier manuscript on vellum have been used for linings; hubbed spine exposed; heavy metal ring with three links of chain attached. Why I love it: The chained book is a show-stopper, and draws attention in every class we brought it out for. More than that, it illustrates a very different idea on the value of books and knowledge than we consider in our age of open access, intellectual freedom, and circulating libraries. 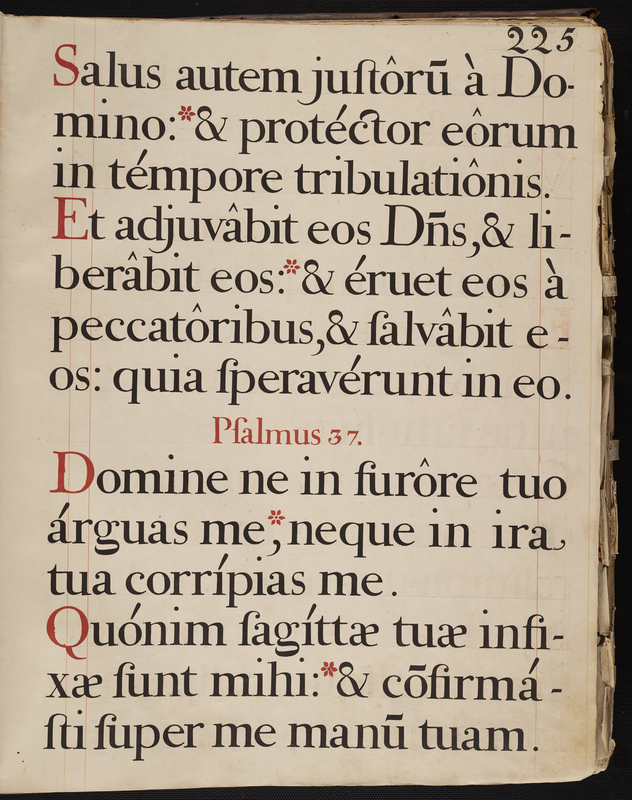 From the catalog: Latin text, without musical notation, beginning with last part of Psalm 29 and ending with hymn: Aurora iam spargit polum, and verse. Includes most of the psalms 30-108, 142. Large breviary of the type used by a choir for readings for Church services. Large signatures of heavy paper, stitched together with heavy string, with leather headband sewn over stitching. 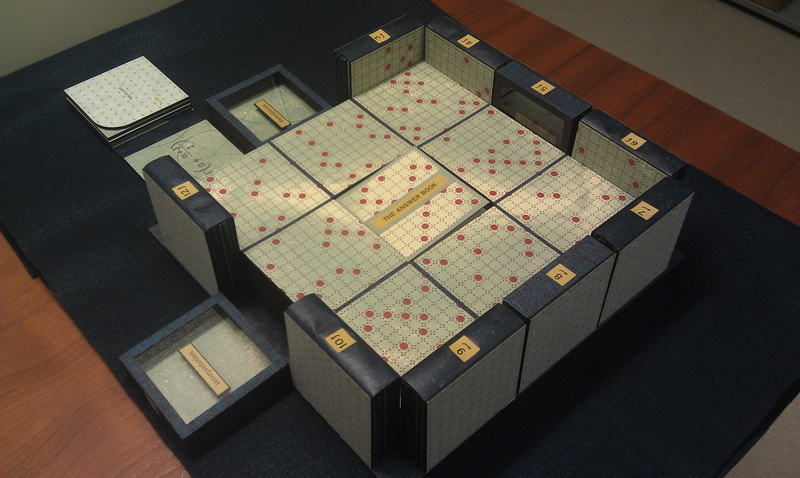 Covers of wooden boards, covered outside with leather and glued to inside of covers, with parchment endpapers glued over them. Holes and impressions on covers indicate metal ornaments were formerly there. Repairs in folio made with strips of plain or Spanish printed paper and verso strips of musical notation (neumes) glued over center edges of pages near binding. Some pages show erasures with letters printed over them and dusted with a white powdery substance. Rubricated ms., possibly hand-printed or stenciled in large black letters, with verses and sections each beginning with 1 or more red letters. Why I love it: This breviary is huge! It’s large enough to have been seen and read by a monastic choir during their daily recitation of the Divine Office. I love being able to interact with this centuries old breviary and actually experience how the monks would have recited their daily prayers. From the catalog: Twelve examples of manuscript music scores used by the Roman Catholic Church in Europe. The texts are in Latin. The music notes are a type of mensural notation. The media is ink on vellum. 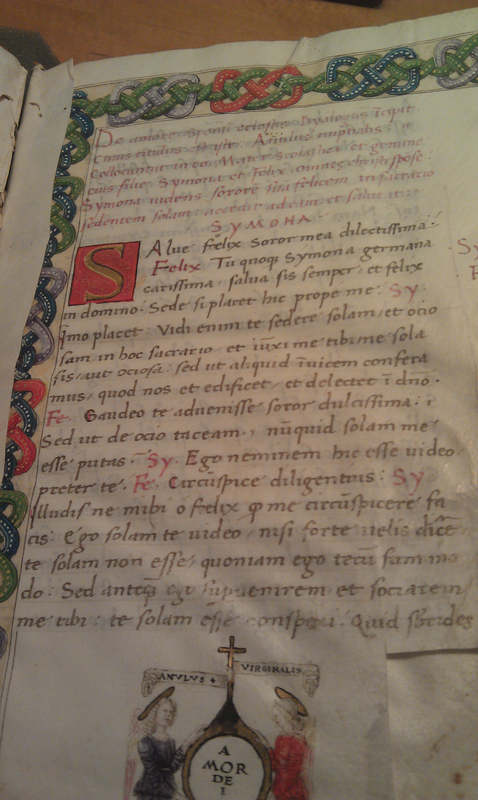 Why I love it: During the Middle Ages, vellum was the preferred substrate. Though this antiphonals were made in the 16th century, it is illustrative of the difference between vellum and paper. Special Collections librarians are constantly learning–both from the collections we curate and from each other. We share our research, knowledge, and best practices through journals and the meetings of professional societies. 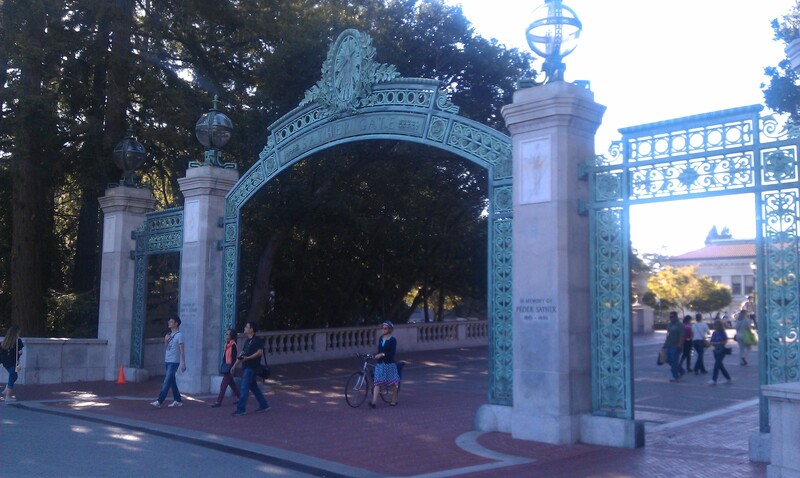 In late June, I traveled to Oakland and Berkeley, California to attend the conference of one such professional society, the Rare Books and Manuscripts Section of the Association of College and Research Libraries, better known as RBMS. The topic of the RBMS 2015 Conference was “Preserve the Humanities! Special Collections as Liberal Arts Laboratory.” Session topics ranged from incorporating digital humanities, engaged collection development, community archives, and, of course, instruction with Special Collections materials. You can find a full schedule of the RBMS 2015 Conference program here. For myself, RBMS 2015 was inspirational. Ethics, the politics of collection development, innovative practices, instruction, and outreach were all up for discussion during the conference. The presenters of this seminar wrote a “manifesto,” advocating that user needs should drive all aspects of a Special Collections library–from technical services to public services, and then presented on their efforts to do so at their institutions. Panel presenters centered their discussion around the idea of social media as a conversation with users. Special Collections libraries can use social media to highlight their holdings, but at its best, social media is a conversation. In designing a for credit class on the history of the book, presenter Anne Bahde approached her class visits to Special Collections as a science teacher would approach a “lab session”–an opportunity for hands on learning. Scheduling four Special Collections for her semester long class, she further broke down each visit thematically, allowing the students’ knowledge to build with each visit. This is just a brief sample of some points that stuck with me, a week after I’ve returned to Florida. For those interested in attending a future RBMS conference: RBMS 2016 is in Coral Gables, Florida. This past week, Katherine Hoarn and myself had the privilege of presenting a paper at the 2015 Society of Florida Archivists Annual Meeting in Miami. Included below is an abridged version of the paper “Adventures in Outreach: A Case Study” by Katherine Hoarn and Rebecca Bramlett. For the first part of the case study, I drew upon the experiences Rebecca and I had while planning, creating, and installing the exhibit “That I May Remember: Scrapbooks of the Florida State College for Women.” When we began this project, my brain was awash in memories of visiting some of my favorite museums: the Museum of Fine Arts in Boston, the MoMA in New York, and the Smithsonian Museums in Washington D.C. I was envisioning clean, slick exhibits in bright, open spaces, with beautiful signage, perfectly cut object labels, state-of-the-art security systems, and objects that had neatly and safely arranged themselves into cases all through their own volition. Then I came back to reality. Exhibits are hard work. They can be a considerable drain on staff hours and resources, but at the end of the day, we believe that exhibits have an important role to play in outreach at our institutions. Exhibits are an important means of outreach because they give exposure to hidden collections. As someone wrote in our exhibit guest book, “I never knew this was here.” Those are exactly the types of people exhibits are meant to attract: people who don’t know about special collections and wouldn’t otherwise walk into our research center. In addition to bringing attention to certain collections, exhibits provide opportunities for community outreach. Since the “That I May Remember” exhibit focused on FSU history, it was easy to generate community interest, but it’s important to think of other historical societies and cultural organizations that might be interested in coming to see an exhibit. Although they can be a lot of work, exhibits are also a lot of fun. They can increase access, promote community involvement, and give us librarians and archivists a chance to flex our research muscles. Exhibits shouldn’t be an afterthought, but rather an intentional part of any library and archive’s outreach strategy. Now I’ll turn it over to Rebecca Bramlett to talk about another important outreach method, instruction. Whether it’s a page from the Gutenberg Bible; cuneiform tablets from ancient Babylon created in 2500 BCE; letters from the eighteenth century, or a first edition of J.R.R Tolkien’s “The Hobbit”—at Florida State University’s Special Collections and Archives, classroom instruction engages, educates and inspires. Instruction sessions with Special Collections materials can spark new passion and interest, and transform student understanding of a subject by facilitating interaction with the original, primary source materials. An instruction session in Special Collections & Archives provides students with the opportunity to interact, engage with, and question topically relevant Special Collections materials under the guidance of their instructor and the Special Collections librarian. 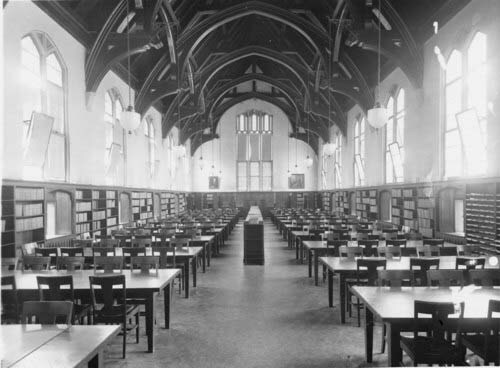 It also provides librarians and archivists with the unique opportunity to reach new users, introducing them to Special Collections by granting students the chance to engage with materials outside of a reading room…. One way we approached instruction sessions was by looking across collections. For example, In selecting materials for the introduction history of text technologies, an undergraduate level English class that focuses on the materiality, functionality, and intentionality of the written word, one thing we did was to juxtapose materials—historically and culturally. We didn’t limit ourselves to just rare books, but included ephemera and manuscripts, as appropriate. For example, we explored similar functions throughout time, with ostraka—Roman letters written on pottery shards in the early 2nd century and the manuscript letters and the cuneiform tablets detailing economic transactions with nineteenth century ledgers, also detailing economic transactions. In this particular instance, the combination of rare books, ephemera, and manuscripts helped deepen the understanding the students were trying to reach. Moreover, different materials engaged different students. In addition to my work as a Graduate Assistant in the Special Collections & Archives Division, I’m a full time student studying for a Master of Science in Library and Information Science at The School of Information at Florida State University. As a Graduate Assistant, I’ve been able to apply the academic knowledge gained from my library classes to the different projects I’ve worked on as a Graduate Assistant in Special Collections & Archives. Additionally, my work in Special Collections & Archives has given me a richer, more practical understanding of the opportunities and challenges that librarians face today. This is a required course in the School of Information’s Master of Science in Information Science program, and for good reason. After taking this course, future librarians better understand the theoretical framework for organizing and accessing information. Much of the first half of the course focuses on the organization of various systems–such as article databases, like JSTOR, and the FSU Libraries online catalog. Understanding how records are organized in the library catalog means that I’m better able to help Special Collections patrons find the information they need. Sometimes patrons only have a vague idea of what they need, or a topic they’re researching and are not aware of all the resources Special Collections has to offer. And while I might not be an expert in every area that Special Collections encompasses, as a librarian, I am able to find you the resources that that you need. This course also introduces the concept of metadata, or “data about data.” Understanding the administrative role that metadata plays in the access and retrieval of a resource was essential for the work I did with the Digital Library Center, in which I digitized 12 issues of The Girl’s Own Annual , and made those issues available to the broader community through FSU’s Digital Library. You can find out more about that project from this blog post. This is an elective in the School of Information, and provides students with the guiding principles behind the construction and management of a digital library. This course also provides students with some “hands on” experience. Using the open source platform Omeka, students in this class create their own small-scale digital library. There has been a lot of overlap between my classwork for Digital Libraries and the work I’ve done as a Graduate Assistant. For my second project as a GA in Special Collections, I created an online exhibit with the platform Omeka, which can be found at fscwscrapbooks.omeka.net. Because it is my hope to continue working in a Special Collections & Archives department after graduating, I wanted to take the opportunity to take formal coursework in archival science. This course is offered through the History Department, and is taught at the State Archives of Florida. My work in Special Collections & Archives provided me with a solid foundation to start with, to which this course has given me a richer understanding of the principles that guide an archivist’s work. One major focus of this class was the Collection Development Policy, the formal document which guides a library’s collecting policies. As a GA, one of my projects this semester has been to make an initial assessment of various rare book donations, according to FSU Special Collections & Archives procedures. Understanding the role and purpose of a Collection Development Policy has been helpful in understanding the process for donation to cataloged item. This is just a sample of the coursework I’ve completed for my Master of Science in Library and Information Science. It has been a privilege to apply the knowledge I’ve gained in my classes to my work as a Special Collections & Archives Graduate Assistant. Moreover, working as a Graduate Assistant has given me a better understanding of the practical applications of the knowledge I’ve gained. Rebecca L. Bramlett is a graduate assistant in the Special Collections & Archives Division. She is working on her Master of Library and Information Science at Florida State University. How do you define “the book”? What functions do books serve? What are the essential qualities of a book? How have these characteristics changed over time? 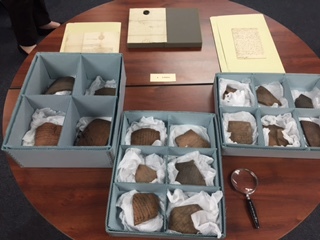 Those are a sample of the questions raised during the Special Collections & Archives instruction sessions for the “Introduction to the History of Text Technology” classes (ENG 3803) and the “What is a Text” class (ENG 4815). For each class, we pull a variety of relevant materials from the Rare Books Collection, encouraging students to interact with the materials during the class session. The visit to Special Collections is an opportunity for students to explore in-depth the specific class themes by engaging with the rare and unique materials in Special Collections & Archives. The concept of the codex (as seen above and left with The Poems of William Shakespeare) dominates initial discussion on the form and function of a book. But for the “Introduction to the History of Text Technology” class, we’ve placed nineteenth century ledgers alongside Babylonian cuneiform tablets that detail temple transactions from 2350 BCE, illustrating a continuity in the function, if not form of the text (see the FSU Digital Libraryrare booksrare for more information on the Cuneiform Tablet collection). For the “What is a Text?” class, students’ notions of what constitutes the essential characteristics of a book is challenged by materials from the Special Collections & Archives Artists’ Book Collection. Many of the artists books from Special Collections & Archives abandon the structure of the codex entirely (as seen in the artist book, Fam-i-ly: a Book by Rita MacDonald, pictured right and Julie Chen’s A Guide to Higher Learning, pictured below). Other artists books play with the connection between text, image, and structure, such as in Emily Martin’s More Slices of Pie. Special Collections & Archives has a rich collection of artists’ books, from a portfolio containing Alice’s Adventures in Wonderland illustrated by Salvador Dali to books created in the last decade that expand our notions of the essential qualities of a book. Each artist book contained in the collection is unique. Through the artist’s interpretation of text, image, and structure, the question of how to define a book is given new meaning. 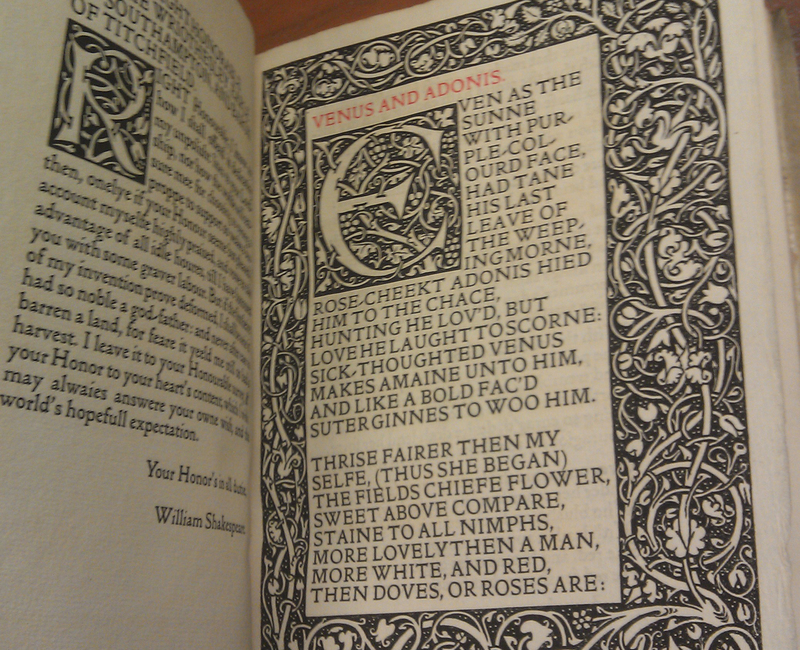 For more information about artists’ books, check out this Research Guide here. Julie Chen’s A Guide to Higher Learning. 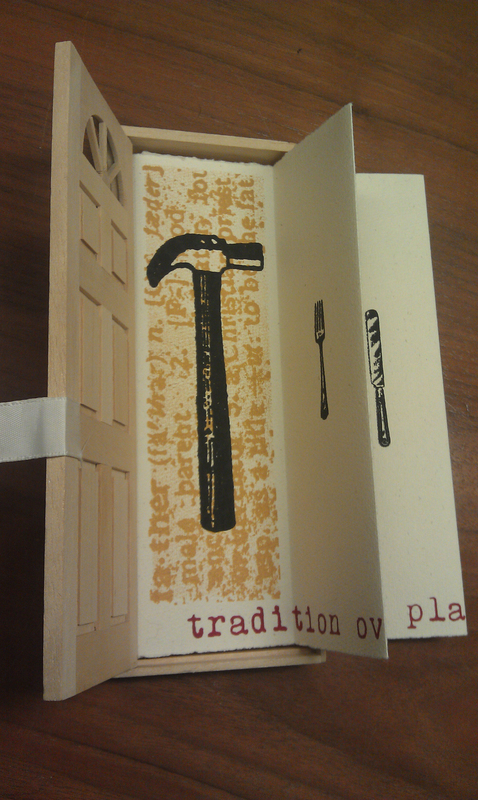 From the Special Collections & Archives Artists’ Books Collection. For more information on this book, see here. 1 As cited by Megan L. Benton, “The Book as Art,” in A Companion to the History of the Book, eds. Simon Eliot and Jonathan Rose, Malden, MA: Blackwell Publishing, 2007: pg. 505. 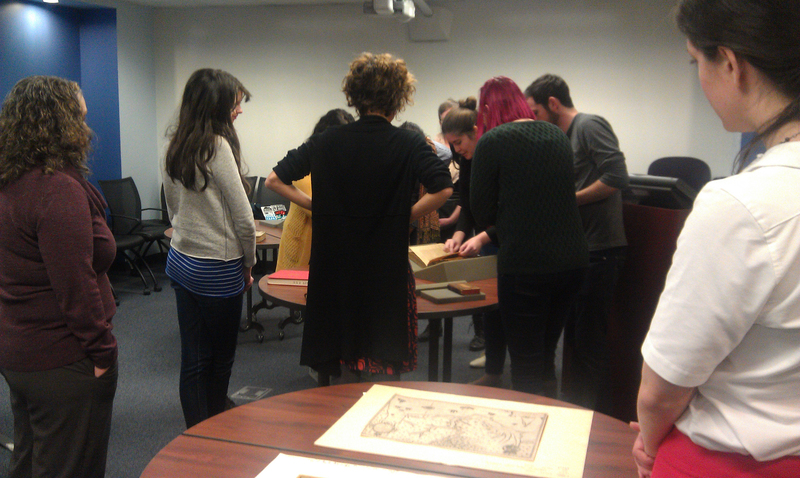 This semester, the Special Collections & Archives Graduate Assistants are delving into the world of rare books! The Special Collections & Archives at Florida State University has an impressive collection of rare books–from Sumerian cuneiform tablets (created in approximately 2000 BCE) to the Grove Press Collection (published in the 20th century) and almost everything in between. Some areas of particular collecting strength include the French Revolution and Napoleonic era, early English Bibles, poetry about childhood, and the history of Florida. 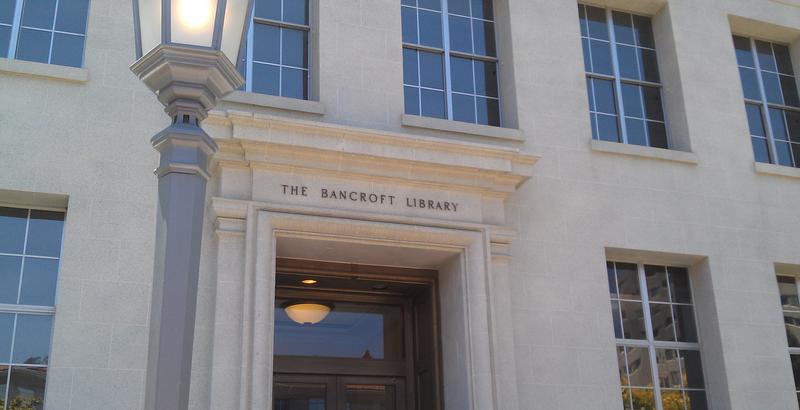 Students and researchers can always access the materials held by Special Collections & Archives in the Special Collections Research Center Reading Room. 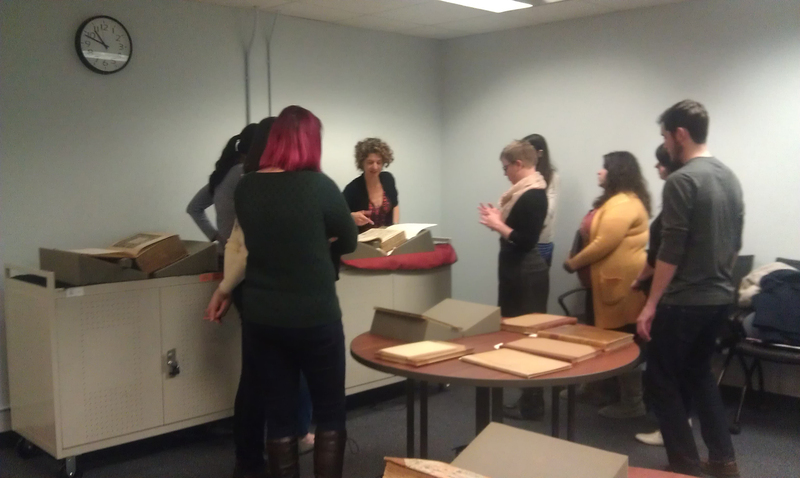 But students can also engage with rare books and archival materials from Special Collections & Archives as part of a classroom visit. An instruction session is a unique opportunity for students to analyze rare books and manuscripts in the classroom setting. With the background knowledge they’ve gained in class, students are able to learn from and interact with primary source materials. session. This helps us determine what materials from the collection might best serve the instructor’s focus. While sometimes the professor knows exactly what materials he or she wants to see, because of our knowledge of the collection, the Special Collections staff are often able to suggest additional items in the collection that might complement the themes the instructor wishes to stress. One of the great things about assisting with classroom instruction has been this opportunity to discover different aspects of the collection. 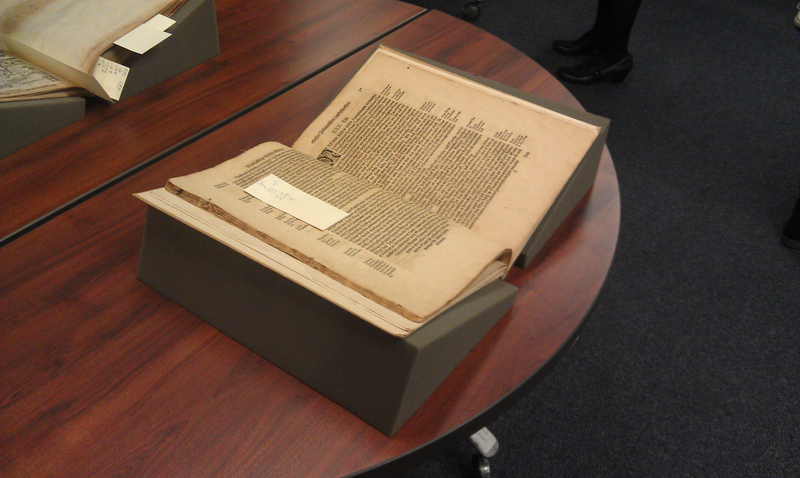 With each class I assist, I learn new things about the rare volumes held in Special Collections & Archives. In preparing for a graduate class on “Renaissance Observation,” I discovered the 1584 volume of the Cosmographia by Peter Apian. Peter Apian (1495-1552) was a German mathematics professor and printer. His Cosmographia is one example of the popular Renaissance genre of cosmography. In the sixteenth century, cosmography combined areas as diverse as astronomy, natural history, and geography. 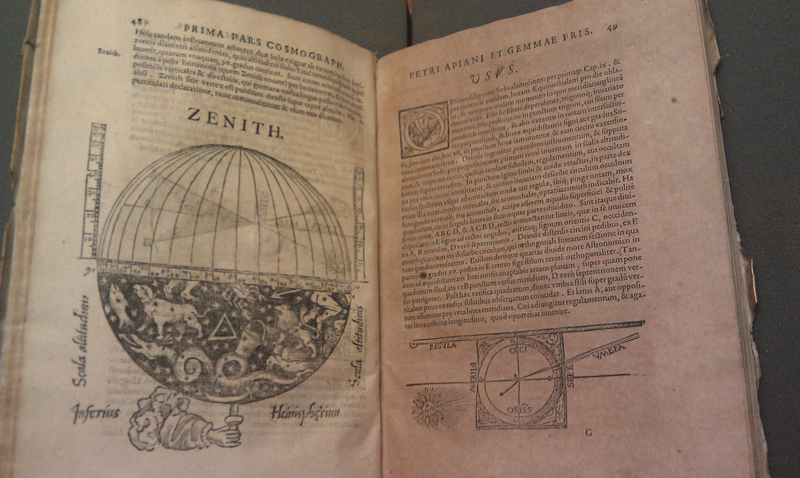 Written in Latin, Peter Apian’s Cosmographia is an exploration of sixteenth century astronomy. One unique aspect of Apian’s Cosmographia is its mathematical focus. 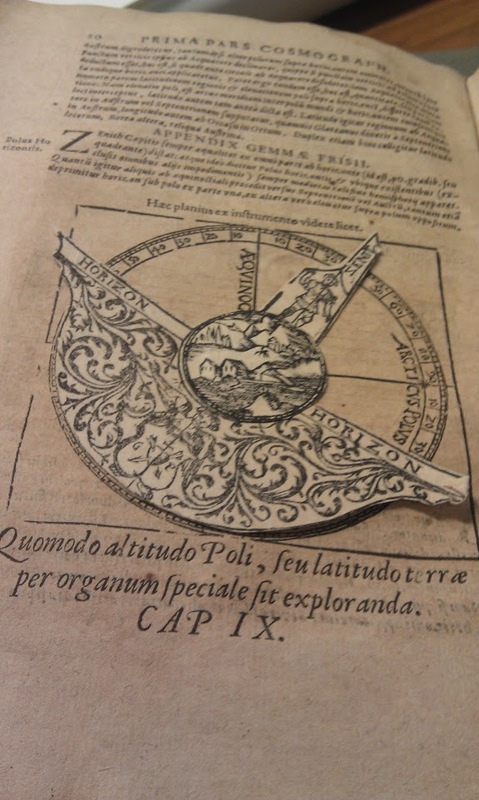 The 1584 edition held by Special Collections contains moving diagrams that help to illustrate his astronomical concepts. In the illustration pictured below, the images of the zodiac are used to map the night sky. Other examples of the Renaissance cosmography genre held by Special Collections include Sebastian Munster’s 1550 edition of Cosmographia. First published in 1544, Munster’s Cosmographia is counted as the first German description and categorizations of the world. Munster’s Cosmographia focuses on geography, the customs of different cultures, and the history of animals and plants. Its detailed illustrations are considered particularly important. You can find these volumes (and many others) in the Special Collections Research Center weekdays, from 10:00 am – 6:00 pm. As Katherine previously mentioned here, our latest project in the Special Collections & Archives Division has been digitizing issues from “The Girl’s Own Annual.” A British serial intended for girls, young women and their mothers, “The Girl’s Own Annual” offers unique historical insight into the contemporary perceptions (and propaganda!) of World War I. Overall, the tone of “The Girl’s Own Annual” is a mixture of edification and entertainment. There are articles on domestic projects (knitting patterns, sewing patterns) and serial fiction (the romances of the day!) These types of articles appear consistently in each issue. For this project, Katherine and I have focused our digitization efforts on volumes 38 and 39, which cover the period 1916-1918. Scattered between serial fiction and instructional pieces are articles that directly and obliquely reference the Great War. These articles give scholars a glimpse into the domestic attitudes toward the ongoing war–its portrayal and the propaganda. 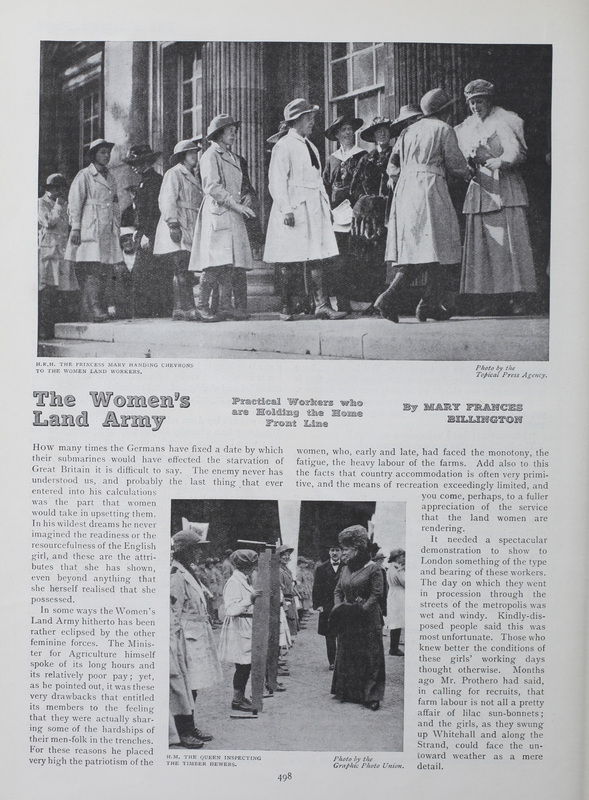 Articles such as, “The Women of the Army: Work that is being done in France by the capable, adaptable, cheerful contingents of our newest military service,” (vol. 39, no. 5) praises the efforts of women directly contributing to the war effort in France. Women are portrayed as supporting the war effort by performing necessary and sometimes complicated tasks. They performed the traditional secretarial and domestic duties, but the article also highlights some of the mechanical work the women perform on “aeroplanes” in need of repair. 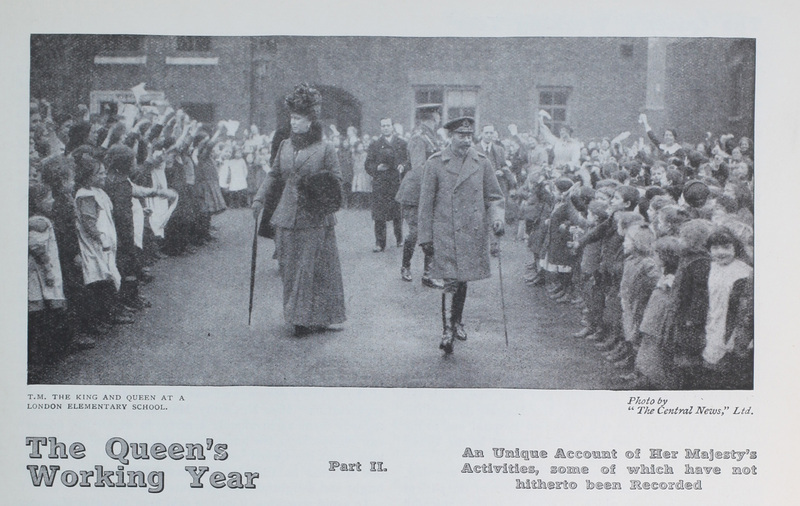 The accounts of the work of the Queen walks a fine line between inspiration and propaganda. Other articles in “The Girl’s Own Annual” are more blatant in their attempt to shape public opinion. In Vol. 39, issue 9 from 1918–after hostilities with Germany have stopped–Germany is presented as a continued threat. Writing on the “On the German Menace After the War,” the editor calls for a boycott of German goods, among other things. Through text and image, the continued threat from Germany is hammered home. 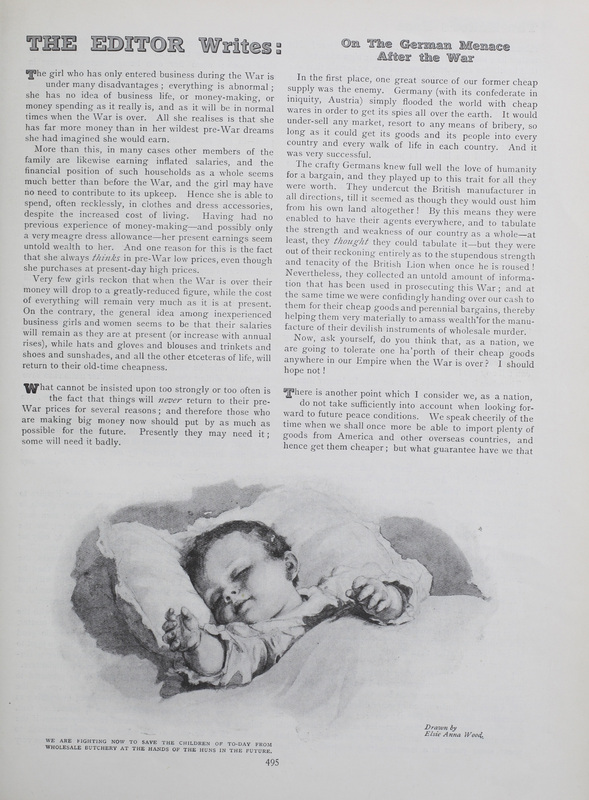 The layout of the article is striking–placed at the bottom of the page is a sketch of a sleeping baby, under which the caption reads: “We are fighting now to save the children of today from wholesale butchery at the hands of the Huns in the future.” The distrust and continued suspicion of Germany is blatant: “No matter how many treaties Germany may sign undertaking that hostilities shall end, how can we be certain that she will not continue to murder humanity wherever it is possible to do it without being actually caught in the act?” the editor rails. It has been a pleasure to make “The Girl’s Own Annual” more accessible. It is my hope that both scholars and students will be able to gain fresh insight into the perceptions of World War I on the British homefront through this project. Currently on display in the Strozier Library Exhibit Room, “That I May Remember: The Scrapbooks of Florida State College for Women (1905-1947)” is an exhibit focusing on the scrapbooks made by the students of Florida State College for Women. See our original announcement here. Now, we are proud to present an online extension of our exhibit. The FSCW scrapbooks are rich with history and full of personality. However, one of the challenges in displaying a scrapbook in an exhibit is that it can only display one page of each scrapbook. This limitation makes it difficult to get the full depth of the scrapbook. 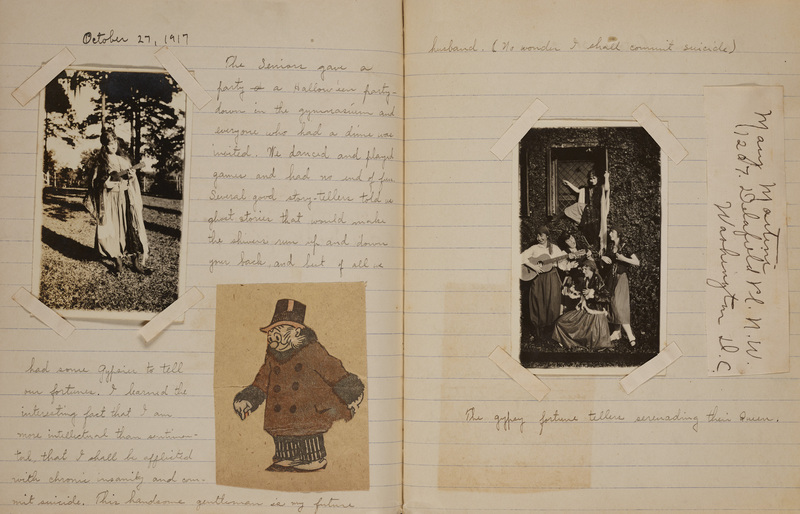 The online portion of “That I May Remember” takes an in-depth look at six selected scrapbooks. 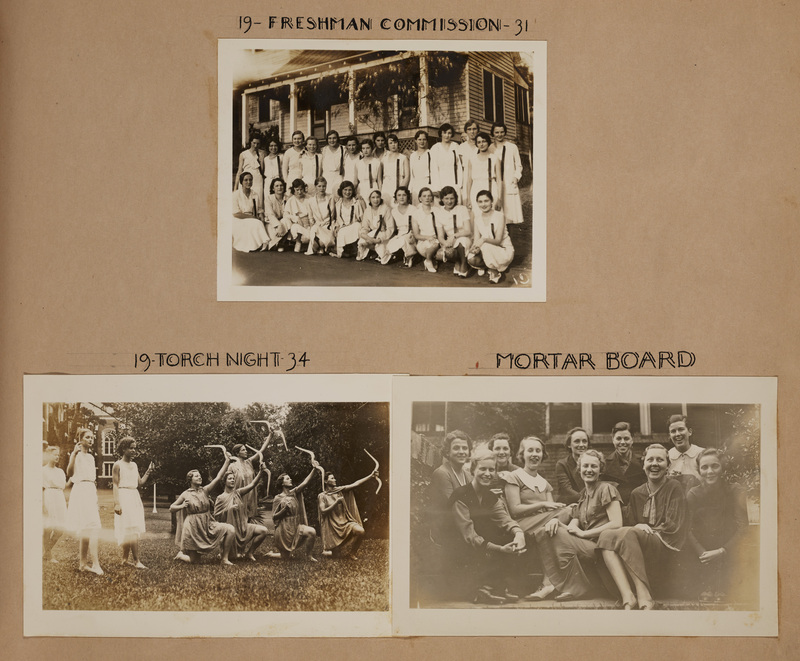 The online exhibit includes over ninety images from each of the decades between the 1910s and the 1940s, while also providing additional history about some of the unique traditions of FSCW. You can find the online portion of “That I May Remember” here. 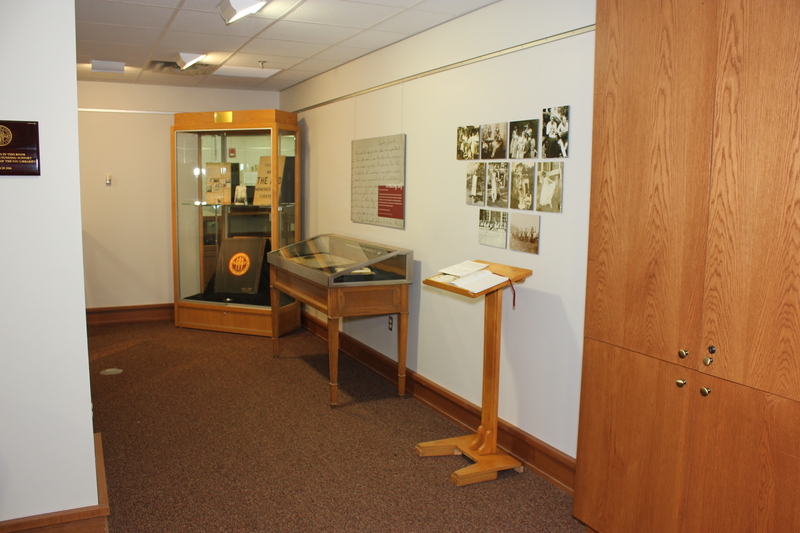 And don’t forget to visit the Strozier Library Exhibit Room to see the scrapbooks in person! 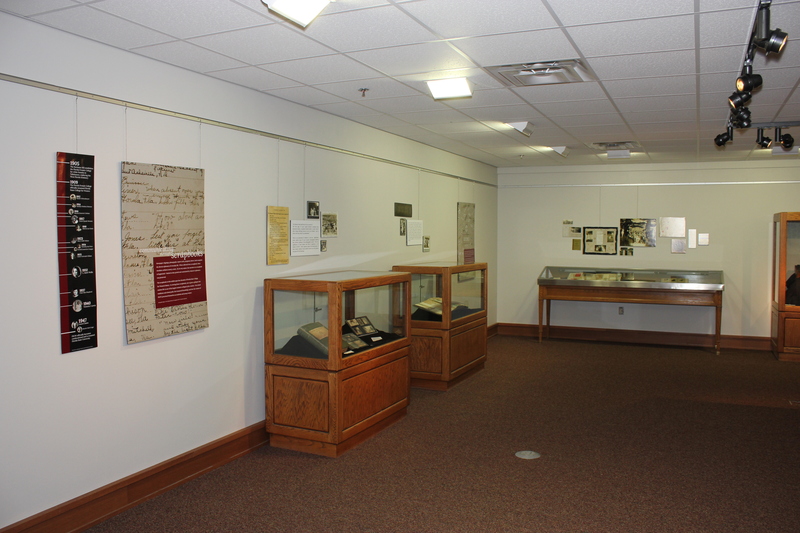 The first step in deciding how to approach the exhibit was to research the history of Florida State College for Women. We consulted numerous resources, but my favorites were the primary sources themselves—the scrapbooks. As historical documents, scrapbooks are special. Each scrapbook is an individual and unique combination of text, photographs and papers. They are arranged in such a way that the interests and personalities of Florida State College for Women students come through. It’s also been interesting to see some similar themes and concerns fill the pages of scrapbooks across the forty plus year span of Florida State College for Women. It would be difficult to choose a “favorite” scrapbook. As each is unique and individual, they are all remarkable in different ways. Marion Emerett Colman’s (HP 2007-130, go here for more information) combination of scrapbook and journal gives the reader a glimpse into the triumphs and concerns of an academically minded college sophomore in 1917. Some scrapbooks delve into current events. Alberta Lee Davis’s scrapbook devotes pages to the end of World War I. 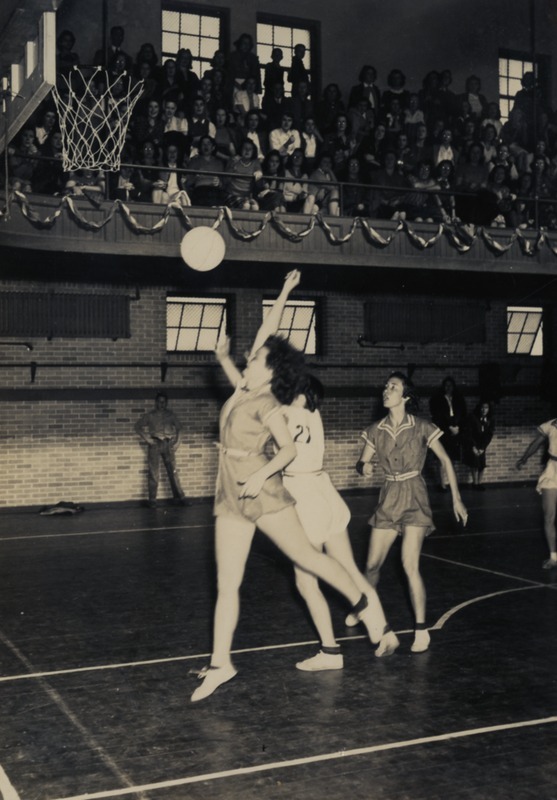 (Alberta Lee Davis’ scrapbook is currently unprocessed. This means that it hasn’t yet been assigned an accession number, the number by which Special Collections & Archives will identify the scrapbook. For the scrapbooks from Heritage Protocol & University Archives, the accession number looks like HP ####-###. This also means that a finding aid hasn’t yet been created in Archon, the database for searching through the manuscript collections in Special Collections & Archives). 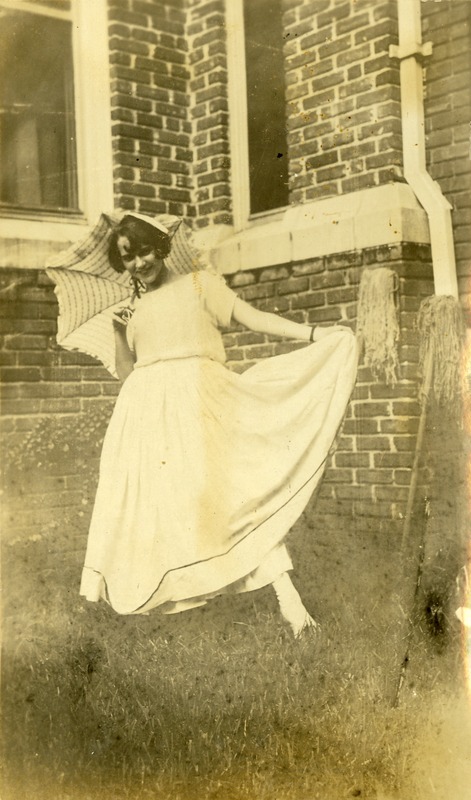 The scrapbooks of Jewell Genevieve Cooper (HP 2007-089, go here for more information), with its newspaper clippings and personal photographs gives its viewer a special glimpse into the traditions of Florida State College for Women during the 1920s. Other scrapbooks, such as that of Victoria J. Lewis (HP 2007-079, go here for more information) shows similar concerns to that of contemporary teenagers, showing us the commonalities between teenager girls at the beginning of the twentieth century and at the beginning of the twenty-first century. The past really isn’t that distant. Finding the connections between past and present has been wonderful, as has learning more about the history of Florida State University. “That I May Remember: The Scrapbooks of Florida State College for Women (1905-1947)” is scheduled to open October 15 – December 1 in the exhibit space in Strozier Library.